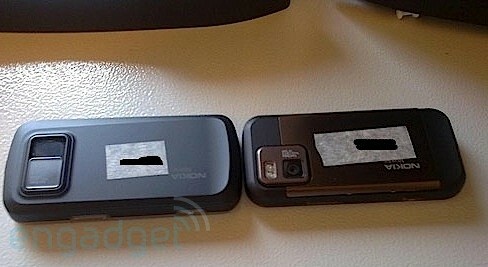 Nokia N97 'Mini' gets pictured in the wild? We've already heard talk of a Nokia N97 Mini (or Mini N97, if you will) from folks who should know what the situation is, and it looks like things have now gotten more interesting still, with some seemingly legitimate pictures of the rumored device finding their way to us that show it out and about with its bigger brother. As you can see above and in another pic after the break, the device is slightly smaller and slightly slimmer than the regular N97, and it's also received a few subtle design changes, particularly on the back, where the camera has lost its sliding cover. Could it be real? Almost certainly -- either that, or it's a tremendously talented KIRF -- though we're not sure we understand the business justification for a new version of the N97 that isn't small enough (or different enough, for that matter) to hold its own spot in the lineup. Not much more to go on than that, unfortunately, but you can pretty safely move this one up a notch on the ol' Rumor-o-Meter.